Former mechanical engineer turned singer-songwriter, Geoff Ong writes typical breakup songs like a lot of artists, but his single “The Last Song I’ll Ever Write About You” “isn’t your typical breakup song: it features Ong’s buttery riffs and falsetto-filled vocals over an upbeat funk track.” Born and raised in New Zealand, Ong moved to Boston to attend the Berklee College of Music: a school with only a 19.2% acceptance rate that many of our featured artists have attended. Thus there is no doubt that these artists are talented, but why should you listen to Ong’s songs? In his own words, ”Ultimately, I hope that people will connect with the music on a more meaningful level than ‘Oh, this sounds nice,’ and that at some point in the future, they will look back and remember how my music was a real part of their lives.” Continue reading to learn about Ong and take a listen here to another single from his newly released EP, The Boston EP. 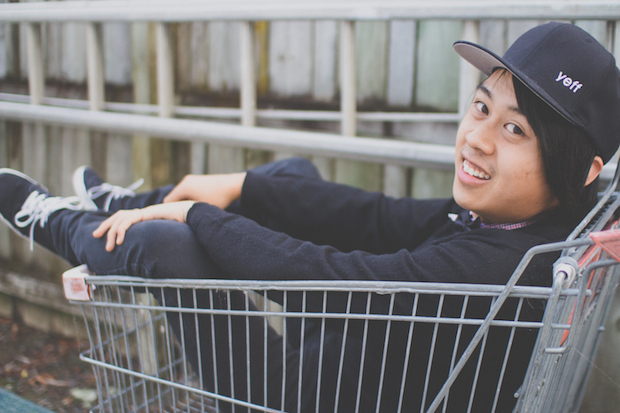 Geoff Ong: I’m originally from Auckland, New Zealand, but I’m now living in Boston, MA! I moved here in May 2014 to study at Berklee College of Music and to pursue my dream of a musical career. I started playing guitar at age 13, and the music bug really just bit me after that! Growing up, I spent hours in my bedroom figuring out my favourite songs and playing my guitar. I played guitar and drums in various bands through high school and university, but I really only started to consider music as a career after I started singing and writing songs 5 years ago. The creative process of writing songs was what made me fully realise that I wanted to be a musician – the act of creating something out of nothing. Ong: I would characterise my music as soul/R&B, but I really listen to all kinds of music! I feel that sounds and influences from other genres are evident in the songs I write. Ong: Oh man, SO many!! But I’d say the main ones would be Sam Cooke, Allen Stone, Michael Jackson, Jazmine Sullivan, John Mayer, Alicia Keys, and Ryan Adams. Ong: Right now I’m promoting the release of The Boston EP, which comes out on March 5. I guess this EP serves as my first foray into the music industry in the USA, and it’s really kind of a chronicle of my experience of uprooting myself and moving over here. I’ve released a couple of EPs prior to this one, and I think I’m starting to figure out what sound I want to create and who I want to be as a musician. So this EP also serves as a way for me to present that to the world. Ong: Music for me is an amazing medium for communication. I feel like it allows me to connect and relate with people who I wouldn’t otherwise be able to do that with, and I think that is so powerful. Music is so intricately woven through our lives—think about the songs you put on in the car while driving around late at night as a teenager, the songs you put on a mix tape to give to a first love, the songs you listened to get you through your first heartbreak, the songs you listened to when you moved out of home for the first time…Think about the connection you feel to those songs. As a songwriter, I want to be able to provide that sort of soundtrack to people’s lives. Ong: I’m actually already working on another EP! However I am far too restless and have much too short of an attention span to work on just one project for an extended amount of time, so I will always be making lots of random new music and experimental things to listen to in the interim. But in terms of overall stuff, I just hope to continue making honest and genuine music. Ong: I really would like to say that my music is geared towards everyone, but I don’t think it’s possible to be all things to all people…I think my music has a certain pop sensibility and is easy to listen to, which is why I think people latch on to it initially. But ultimately I hope that people will connect with the music on a more meaningful level than ‘oh, this sounds nice’, and that at some point in the future, they will look back and remember how my music was a real part of their lives.